Maria’s card is so fun with the pop of color against the white! Your Hedgehog with Coffee stamp set is adorable! Great showcasing of products by the team. My favorite coffee related project is Jo Herbert’s card. My favorite product is your Layered Coffee Cup dies. I love the Layered Coffee Cup dies. I love anything coffee! Maria’s card is my favorite because I love what she did behind the cup giving it a fall look. I really love all these projects but Jo Herbert’s card reminds me of a Vanilla Latte…yum! Coffee is my life! Beautiful cards! I love the layered coffee cup dies. Lisa Schneider-Golzbein’s card is adorable with the monsters. I like all the cards, especially Tina’s card. Also, I like the ‘Lets Get Caffeinated’ stamp set. No way I can pick only one favorite project, because all of them are fabulous! Everyone did a great job!!! As for the products, I really like the “Let’s get caffeinated” stamp set. Cute! I love Caren’s let’s get caffeinated!! I can definitely see myself making a card like that! Hard to pick just one, but I would have to say the coffee cup. So fun to put together and was just the size I was looking for!! Love Tina’s card. My favorite product is “Mug Life” from Ink Road. Thanks! Awesome coffee-themed creations for today’s hop! Happy National Coffee Day! Hard to choose a favorite, but Jo’s pretty card really catches my eye! Love that textured background and the soft colors she used! Great cards! It’s hard to choose a favorite, but I’m going with Jo’s card. I love all the subtle colors and the textured background. My favorite of the coffee related products that you carry is the hedgehog with the scarf by Gerda Steiner. I really like texture and Jo Herberts card fits that ticket. Love the embossed beans in the background. I like all coffee related products but that Newton Loves Coffee stamp set is so cute! (sorry its out os stock). toss up between Lisa and JO. all the cards are awesome.Monster fun is my store favorite. Love all the designer cards!!! My fave is Jo Herberts. Love the embossing paste. Fave coffee product: Sassy Coffee 3″x4″ Clear Stamps by Technique Tuesday. I like Caren Coffee, Coffee, Coffee, etc card very much – I like all coffee related products – Let’s Get Caffeinated is a favorite – love me a Mocha too! Thanks for being a super sponsor! What amazing projects. I love the coffee bean embossing folder! Such great inspiration here! All kinds of coffee designs! Thanks for participating! Loved the Coffee is the Most Important Meal of the Day! So cute!!! But I think I love the Newton Loves Coffee stamp set even better! Happy National Coffee Day! Lisa’s monster coffee card makes me smile so much, that’s gotta be my fave for today, and for products? Let’s Get Caffinated – you can’t go wrong with those sentiments. Thanks for being a sponsor and thanks for the discount code! I put in an order and finally got the paper pad by Doodlebugs that I have been wanting for what seems like forever! lol So yeah, that would be my favorite. All of the DT cards are so awesome and they make it quite difficult to pick one as a fave. I do love the coffee bean BG done by Jo. And my favourite coffee product is the Layered Coffee Cup dies. I can see it being made as both coffee and hot chocolate – it would be super cute to send one to my sisters with gift cards inside to treat themselves with (especially my poor, broke college student sister!). It’s still quite chilly here, so being able to go out and splurge on a donut and coffee / hot chocolate would brighten up their day for sure! What great cards! I think I like Jesse’s the best because of the beautiful background die and the colors used. From the site, My favorites are- Thanks a latte by Lawn fawn and Coffeesaurus by Gerda Steinner. Love the layered coffee cup by Tiny Dornbaum. So cute and simply done! All the projects are wonderful! They’re all so darn cute but I love the peacock background die that Jess used on her card! I love “let’s get caffeinated”! My fav from the coffee/tea items in the store is the Poppy stamps stacked tea cups die! And my fav project is Maria’s lovely framed sentiment card! Like the variety of creations. Like the layers. Like the Autumn colors. Like the whimsy. Like the layouts. Jo Herbert’s card is awesome. I love those layered dies! I just love all your cards!!! WOW! They are ALL such Fabulous designs!! 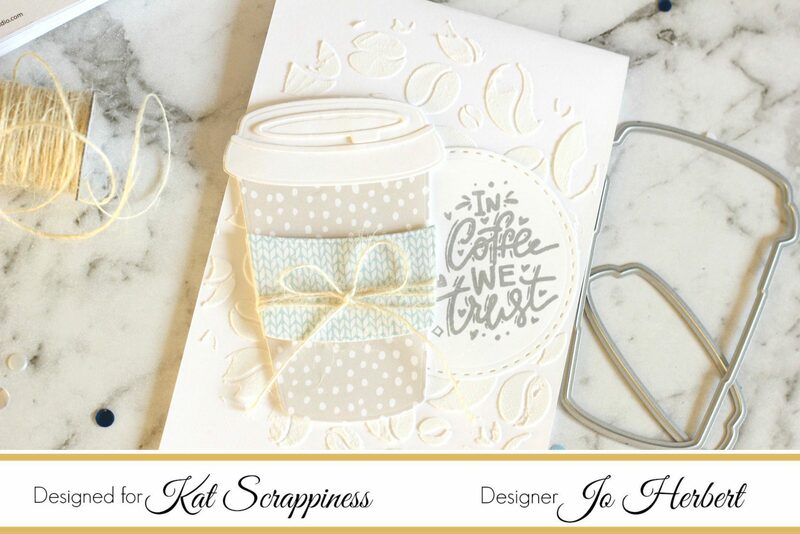 I’m Lovin’ Jo Herbert’s card… so pretty and I LOVE the Layered Coffee Cup dies! Looks like a great set! I really can’t pick a favorite, they are all wonderful. My favorite product is the “Let’s Get Caffeinated” set. Thanks for sharing and being a sponsor. Such cute cards! Love the Life Begins after coffee card. Lovely colors! My fave coffee related item is the coffee ring. I seem to make those every morning! Just lovely cards. Great stamps, patterns, and designs. Jo Herberts card is my favorite project on your blog today, so lovely in soft colors and patterns. And “Layered Coffee Cup” dies are my favorite product you have.Thanks for the inspiration!!! I love Jo’s. It’s so cute. Thanks for being a sponsor. 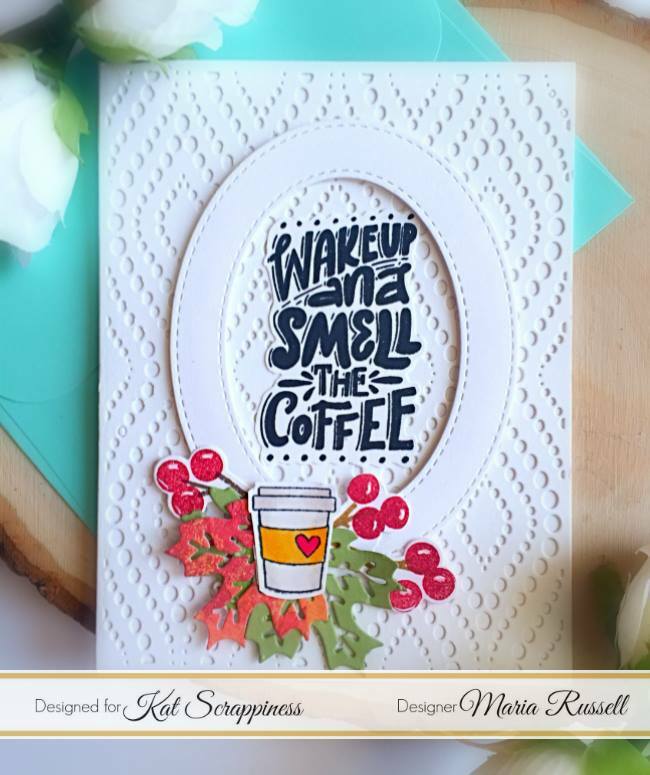 My favorite project from this post is Caren Bartholomew’s card, I love the coffee bean background and the design/colors makes me almost smell coffee lol and I love the sentiment. My favorite Coffee Related Product at Kat Scrappiness is Sassy Coffee by Technique Tuesday, those sentiments crack me up. I’m really loving Jo’s coffee card. It has an elegant feel to it. The latte sequins and new Lawn Fawn coffee set caught my eye in your shop. Thanks! Beautiful cards. Loving all the layouts! Loving that little tab on the lid of the cup…makes it look that much more real…love the die. Thanks for sharing with us and being a super sponsor for this BlogHop. Oh my, there’s no way I could just pick one favorite project from this post! Everybody’s projects are wonderful! I love the Kat Scrappiness Layered coffee cup die! My favorite from today is Jo’s. What I need from the store is the coffee cup does. They have been on my want list too long! I love all of the cards on the blog today! My favorite is Jo’s, because I love her color palette! 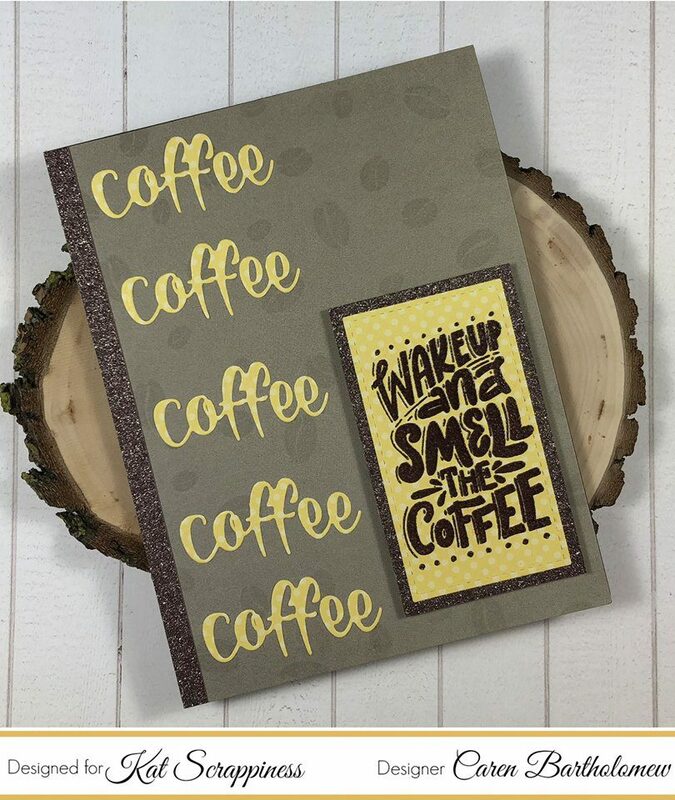 Kat Scrappiness has SO many awesome coffee themed products! I love that Lawn Fawn stamp set, and the This Chick runs on Coffee! I would really have a hard (but fun) time picking out a few sets! 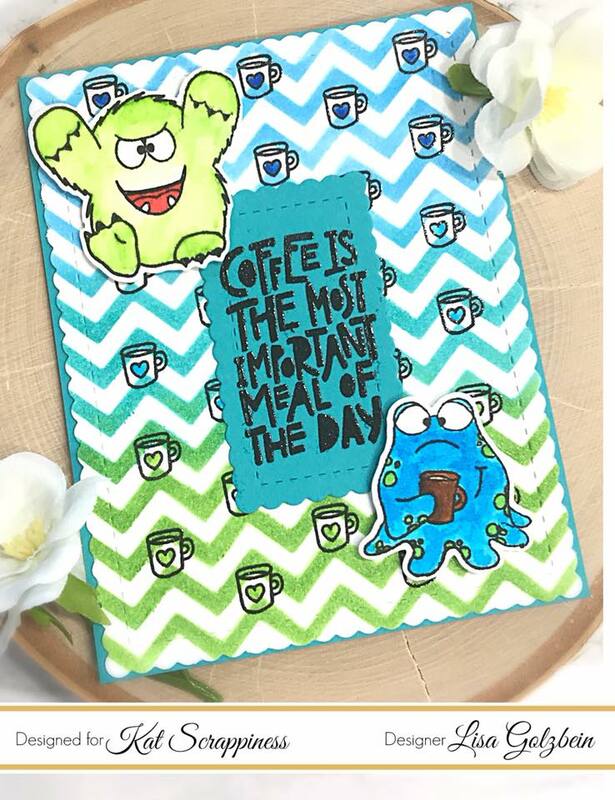 I love Lisa Golzbein’s card with the adorable coffee monsters!! I especially love the background with all of the coffee cups! Favorite coffee product in your shop would have to be the Let’s Get Caffeinated stamp set. Loved hoping along today!! Thanks for the chance at this giveaway! These are amazing. My favorite card is Tina’s. And I LOVE the Layered Coffee Cup dies. Mt favorite coffee project here would be Maria’s card! And for my favorite coffee product of yours here would be the Layered Coffee Cup Die Set! love the let’s get caffeinated set and the soft ewhite colors on jo’s card! It’s just SO hard to pick a favorite, but there’s just something about Maria’s card that catches my heart. I love the warmth and texture of her sweet card and those darling red berries against the white. As far as product….again very difficult to pick a favorite, but I’d have to say the Layered Coffee Cup Dies are right up at the top of my list. you have a lot of fabulous product, so I thank you for all the fabulous inspiration. My favorite project is Jo Herbert’s coffee card. 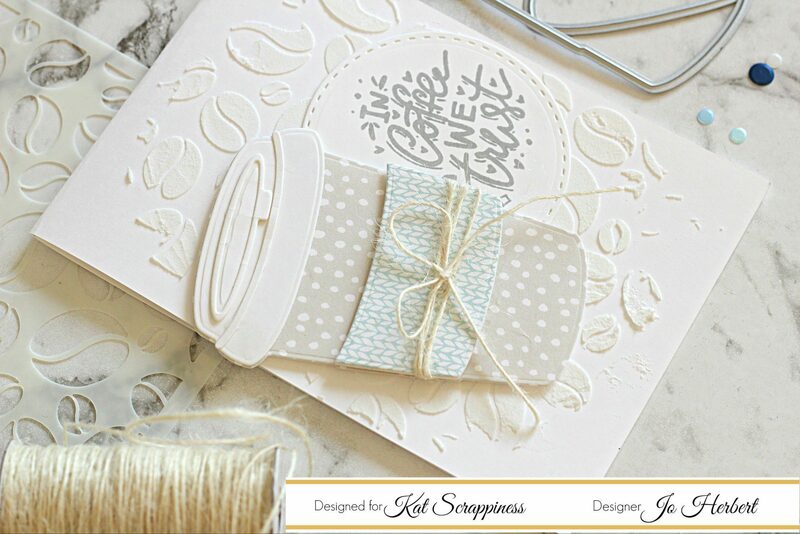 I love the textured background she made and the softness of the cream color she used for the card. My favorite product is the Layered Coffee Cup Cutting Dies. I love all the cards especially Jo’s and the coffee layered dies! Awesome inspiration from the designers! Thanks for the coupon and for sponsoring! Fun card designs!!! Thanks for being a Super Sponsor!! 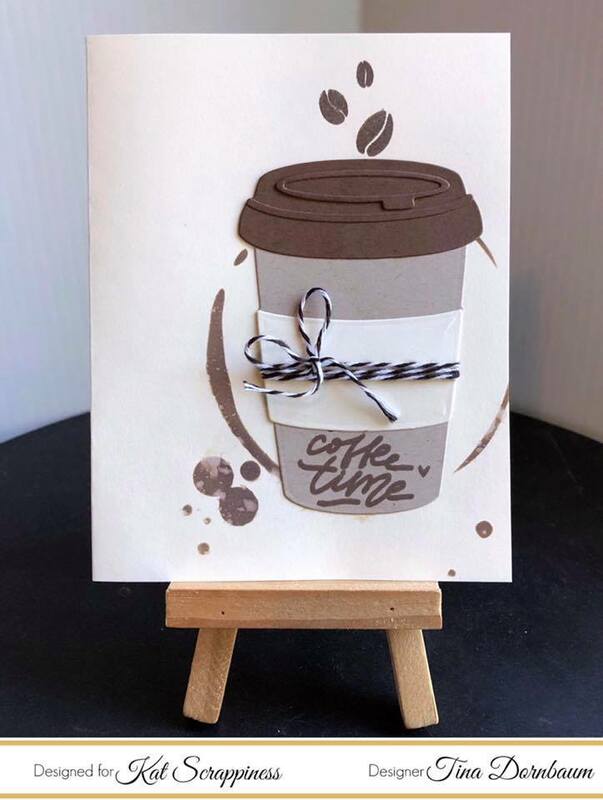 My favorite coffee related project is Jo Herbert’s card and my favorite Coffee Related Product from your shop is Coffee – Sizzix Framelits Die & Stamp Set. Simply Fabulous cards and wonderful inspiration!! Favorite Coffee Related Product is Maria’s card with the “Let’s Get Caffeinated” stamp set, with the Peacock Backdrop die and the double-stitched oval dies, all from Kat Scrappiness. They are all cute but if I have to choose one I’ll go with Jo’s project and the Newton loves Coffee stamp set is adorable. for so many other projects. I really do hate picking favorites…love them all… but if I have to I’d say Maria’s! It’s so sweet and of course that background die… which I have and will be using very soon..lol! Thanks so much for being a sponsor! OH! And my favorite coffee related product… has to be the cup die! Love the size and love the way the lid is… very cool and different from all the rest! Thanks again! 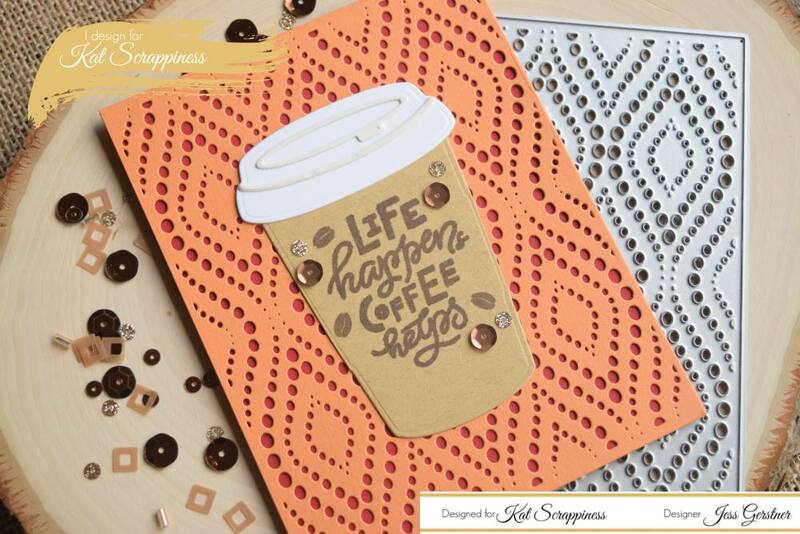 All of your DT projects are wonderful but Tina’s card with the amazing layered coffee cup die really caught my eye. That die is one I would use all the time, so it’s also my favorite Kat Scrappiness product. So many fabulous creation, my fav is Jess’s love that cover plate she used on her card! Wow so hard to pick just one card but Jo’s soft colours really caught my eye. Love the Thanks a Latte stamp set by Lawn Fawn the best! Fabulous cards! I love the Let’s Get Caffeinated & Layered Coffee Cup dies. I love these designs! It’s a hard choice, but the monster card might be my favorite. I’m traditionally a paper crafter (new to stamping), so my favorite set is the “Layered Coffee Cup” die. So much fun! This is a fabulously fun card! Love them all but the “In Coffee We Trust” is my favorite 🙂 Also love the Sassy Coffee Sentiments by Technique Tuesday 🙂 Thanks for the inspiration and the giveaway! I think Tina’s card is my favorite, but they’re each so uniquely inspiring and sweet. Thank you for sponsoring this special blog hop. Now, I’m off to have another coffee. Love all of these projects! That travel cup is my fave so the projects with that are my fave! Thanks for being a sponsor! Hard to pick a fave, but would have to be Jo’s card – white, calm, morning before coffee! Love the ‘Let’s Get Caffeinated’ stamp set! All the projects are great. I love the stamp and die set so I’d choose the first two–Tina’s is striking and Jo’s is stunning. I’m in love with the background dies that were used here. My favorite card is Cynthia’s pretty blue coffee themed design. And my favorite Kat Scrappiness product is the Wonky Wavy stitched rectangles…what a fun die! My favorite coffee related product is the cup die! I love Jo’s card and the layered coffee cup die! So many great cards though!! I love Maria’s card. It’s white with that pop of color. I like the layered coffee cup die even though I love hot tea! I love Lisa’s card. All of them are so creative. Thanks for sharing. My favorite card was Maria’s Wake up and Smell the Coffee. I love the Peacock background die. But I also like the layered coffee cup die, too. My favorite product is the Got coffee Die from kat Scrappiness and my favorite project is by Lisa ” Coffee is the most important meal of the day!” That is just ADORABLE! It fits me well ! HAHAHAHA! Although I loved all your beautiful DT’s work and I thank you for sharing their wonderful talents with us! Have a blessed Day! Love Lisa’s card and sentiment. What an amazing line up of talent from the team! I’m am literally being blown away by all the caffeinated works of art! Thank you so much for sponsoring! My favorite is Jess’s card and my favorite product is the coffee bean stencil by Gina Marie Designs. All the cards were wonderful, but I like Maria’s the best. Like the splash of color on it. I also like the caramel latte sequin mix. So many uses for those colors. Thanks for sharing with us. Love them all, but my fave is Jo’s and that Layered Coffee Cup Die. I love the soft colors of Jo Herbert’s card, And I love the background in Jess Gerstner’s card. Both are amazing! !